Ruth Dunigan is proud. Her son, David, is excelling at a full-time job and managing his money well enough to buy his first vehicle, a silver Jeep Liberty. Those may seem like ordinary things for a 25-year-old, but David is not ordinary. His mother, a participant in the Simons Simplex Collection autism research program, hopes his story will give other families hope – and possibly a map to follow along the notoriously difficult road from school to adulthood. As she explains, understanding your rights to disability services is key, something she learned in part by working for a disability organization. "I had the privilege of knowing a little bit more about the game before I had to play the game," said the plain-spoken Texas native. I watched my typical, loving, talking, broccoli-eating child disappear before my eyes and become someone I didn't know. David is the youngest of Ruth's five children. Shortly before his second birthday, he began to retreat into a different world, looking through his mother rather than at her. "I watched my typical, loving, talking, broccoli-eating child disappear before my eyes and become someone I didn't know," Mrs. Dunigan said. The family moved from Texas to Missouri when David was young, so his father could attend a Christian seminary. David began receiving help at the University of Missouri, home of the Thompson Center for Autism and Neurodevelopmental Disorders, in Columbia. Her husband, who has a master's degree, took a night job as a janitor at a middle school so Mrs. Dunigan could stay home with David. Using a picture exchange system and visual reminders, she helped him re-learn skills he had lost and gain new ones. She signed him up for speech, occupational, and horseback riding therapies. "Whatever therapy was available, we did it," she said. "We did the full court press from the get-go, because of our age." She and her husband, also named David, were in their late 30s when their son was born, and would be heading toward retirement when he reached adulthood. "We knew we had to prepare him for independence early on," she said. As she explained to David, "We're not going to be around forever, son." David received an Individualized Education Program (IEP) at school, which entitled him to special educational services and accommodations for his disability throughout his school years. Like many parents, Mrs. Dunigan learned to advocate for her son. If his school balked at providing help he needed, she said, she would call an IEP meeting to discuss it. She also advocated for others. She got a job at Missouri's Parent Training and Information Center, where she helped teach parents about their children's special education rights. She accompanied them to IEP meetings to help them push for school services and therapies for their child's disability. David briefly went missing at age 7 – children with autism are at high risk for wandering away6 – so Mrs. Dunigan sprang into action. She lobbied for a program to help first responders find people with disabilities who wander and became lost. Her county adopted the Care Track system, which helped provide tracking devices to children and adults who wandered. (Care Track is similar to Project Lifesaver). At home, Mrs. Dunigan taught David how to cook, manage money and other skills for adulthood. She knew he would become a careful driver, because he was very good at following rules – and reminding her when she did not. "When I was driving, he would say to me, 'Mom, the speed limit is 55, and you're going 57.' When the oil light came on in my husband's Dodge, he said to me, 'When are you going to take care of that?'" David began working with a vocational rehabilitation (VR) program, one of several he would use after high school. Funded by state and federal dollars, VR agencies are tasked with helping people with disabilities prepare for and find work. He landed a job collecting shopping carts at Walmart, working outdoors in snow, rain, and summer heat without complaint, his mother said. The VR program sent a job coach to help him at Walmart. The coach abruptly stopped coming after 30 days, rather than slowly reducing his support, as Mrs. Dunigan would have preferred. "Having a coach was kind of a hindrance," recalled David. "I didn't need a shadow because I don't have trouble staying on task," he said. Use this LIST to find the Vocational Rehabilitation agency in your area. His father changed jobs, and the family moved back to Texas. There, David got a job assembling bicycles, but it did not work out. David did not tell his employer he has ASD, and his mother wondered if the job might have worked out better for him if he had. In the United States, a worker who discloses a disability may be entitled to accommodations to help him on the job. But some employees worry that disclosing could open them up to prejudice, as well. Other aspects of life in Houston were not a good fit. Although David had a driver's license, "I could not let him drive in Houston traffic," his mother said. Too many drivers did not share his interest in following the rules of the road, in her opinion. "That is the most red-light-running city I've ever seen!" she said. The first step would be to scope out the place and take reconnaissance on the job you want. See if it has a basic day-to-day pattern. Some of her older children had already settled in northwest Arkansas, so the Dunigans moved there next. David began working with a VR agency, which helped him update his resume and interviewing skills, and land a job at Domino's Pizza in 2017. 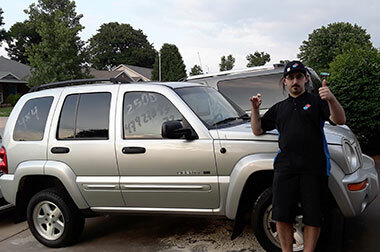 In an interview, David said he enjoys working between two Domino's locations, where he does everything from food preparation to waiting on customers, whom, he points out, are called friends. A typical day for him starts with putting out tubs of pizza ingredients. He also takes meal orders, works the cash register, and makes pizzas, as needed. "All of us are trained to do just about everything," he said. He prefers order and predictability, which this job provides. "I'm speaking just for myself: I like routines. I wanted a job that had a pretty stable routine, with not much change from day to day, something predictable." When asked his advice for other job seekers with ASD, he recommended learning as much as possible about a potential job in advance. "The first step would be to scope out the place and take reconnaissance on the job you want. See if it has a basic day-to-day pattern," he said. Planning for life after high school should begin as early as possible, experts advise. U.S. law requires that a "transition plan" for adulthood be part of a student's IEP by age 16, and some states require it at younger ages. A transition plan should outline how students will prepare for college, work, job training, independent living, and adult disability services. However, Mrs. Dunigan said, she attended IEP meetings for students who lacked suitable transition plans. "Don't let the school put it off until your child's senior year," she advised. Based on her own experiences, she encouraged clients and their families to ask a lot of questions before choosing a vocational rehabilitation provider or program. "Just because you call an organization and they say they don't do something, that doesn't meant they don't do it. Call the next day and you may speak to someone else who gives you a completely different answer," she said. Find out what a VR agency will do for you, how big their caseload is, how much time they spend with each client, and how "hands-on" their staff will be, she said. For those who get job coaches, she said, try to negotiate what their services will look like, how many days they will be with the client on the job, and for how many hours per day, and whether they will be available at other times to answer questions. "Find out what else they offer, such as vocational testing, workshops, and social events," she said. David's current VR agency offers social events for clients and helpful workshops on the benefits and pitfalls of living on one's own, she said. David said he's happy with his job and, in his free time, enjoys video games and anime. The next big thing for him, he said, would be to move out of his parents' home and get his own apartment. "That's one hurdle I have yet to overcome, but I'm working on it," he said. "As much as I enjoy working at Domino's, on my pay I really can't afford an apartment now." But, as he has shown with his Jeep purchase, he knows how to save his money to reach his goals. To find the vocational rehabilitation agency in each state, the District of Columbia, and Puerto Rico, see this LIST from the U.S. Department of Labor and Job Accommodation Network. How well are Vocational Rehabilitation agencies preparing people with autism for the workforce? Read Autism and the Workplace: How Well Are We Doing? Watch a video on Preparing for the World of Work with Dr. Ernst VanBergeijk, a professor at Lesley University who works with teens and adults on the spectrum. Read the SSC@IAN transition series, which begins with "Coming of Age: Autism and the Transition to Adulthood." Credits: Photos of David Dunigan and Ruth Dunigan reprinted with permission of the Dunigans. Illustrations by 1) iStock, 2) Pixabay. Gerhardt, P. F., & Lainer, I. (2011). Addressing the needs of adolescents and adults with autism: A crisis on the horizon. Journal of Contemporary Psychotherapy, 41(1), 37-45. doi:10.1007/s10879-010-9160-2. Abstract. Donvan, J., & Zucker, C. (2016). In a different key: The story of autism (1st ed.). New York: Crown Publishers. Anderson, C., Law, J. K., Daniels, A., Rice, C., Mandell, D. S., Hagopian, L., & Law, P. A. (2012). Occurrence and family impact of elopement in children with autism spectrum disorders. Pediatrics, 130(5), 870-877. doi:10.1542/peds.2012-0762; 10.1542/peds.2012-0762. Abstract. Shattuck, P. T., Narendorf, S. C., Cooper, B., Sterzing, P. R., Wagner, M., & Taylor, J. L. (2012). Postsecondary education and employment among youth with an autism spectrum disorder. Pediatrics, 129(6), 1042-1049. doi:10.1542/peds.2011-2864. Abstract.